LSU School of Medicine’s Enhancing Quality Im provement for Patients (EQuIP) rotation continues to provide an in-depth orientation to the principles of quality improvement, patient safety and process improvement for LSU House Officers rotating at University Medical Center New Orleans (UMCNO). The rotation, available as two-to-four week blocks, offers a flexible schedule and curriculum that best accommodates resident quality and safety education needs. Rationale – The Accreditation Council on Graduate Medical Education’s (ACGME) Common Program Requirements require that residents integrate and participate in interdisciplinary clinical QI and PS programs at their clinical sites. Further, their Clinical Learning Environment Review (CLER) visit has added a conceptual framework that includes a focus on patient safety and healthcare quality, such that residents must participate in the reporting of errors, unsafe conditions and near misses, by involvement in interprofessional teams aimed at promoting safe care and improving systems and processes that positively affect patient outcomes. The EQuIP rotation provides exposure to multidimensional aspects of Quality Management and Performance Improvement. It allows exposure to the ACGME accreditation process, including the CLER site visit, residency training RRCs, program requirements and program specific milestones, the Joint Commission, the function and duties of the LSUHSC School of Medicine EQuIP office and an introduction to and participation in UMCNO Quality, Safety and Risk Management committees and practices. Deliverables – The rotation has been consistently positively rated by resident participants, as evidenced in pre and post-rotation survey results over 4 consecutive years. The ideal deliverable, upon completion of the rotation, is active resident participation in meaningful, well-planned and measurable quality or safety projects that utilize industry-standard quality and safety methodologies. Present State – The EQuIP rotation includes its largest group of learners to-date. 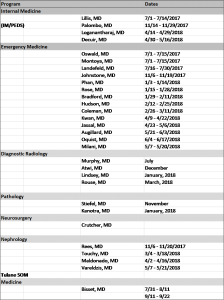 (Figure 1) The addition of the Nephrology and MED/PEDS programs brings the list of medicine specialties involved to an all-time high of seven –Emergency Medicine, Internal Medicine, Pediatrics, Diagnostic Radiology, Pathology, Nephrology and Neurosurgery. 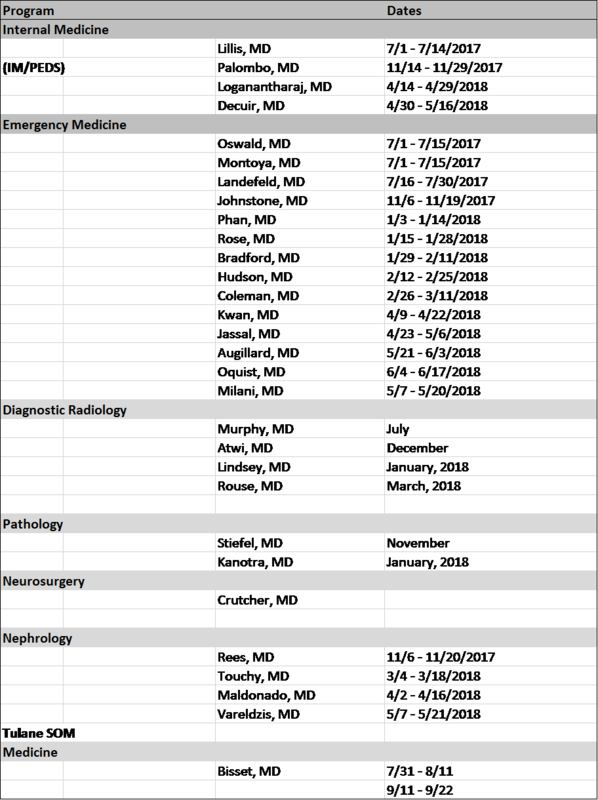 Future of EQuIP – Goals for the future of the EQuIP rotation include continued growth of this innovative educational intervention, with the possibility of additional rotations at other LSUSOM clinical sites. Also, curriculum updates are presently under consideration and include education on systems and process-based improvement through Mock Root Cause Analyses (RCAs). Rotation leaders are also considering teaching quality through simulation. Questions? Visit the EQuIP rotation page. For more info, view the equip rotation syllabus.